Please note: Packaging may differ from picture. 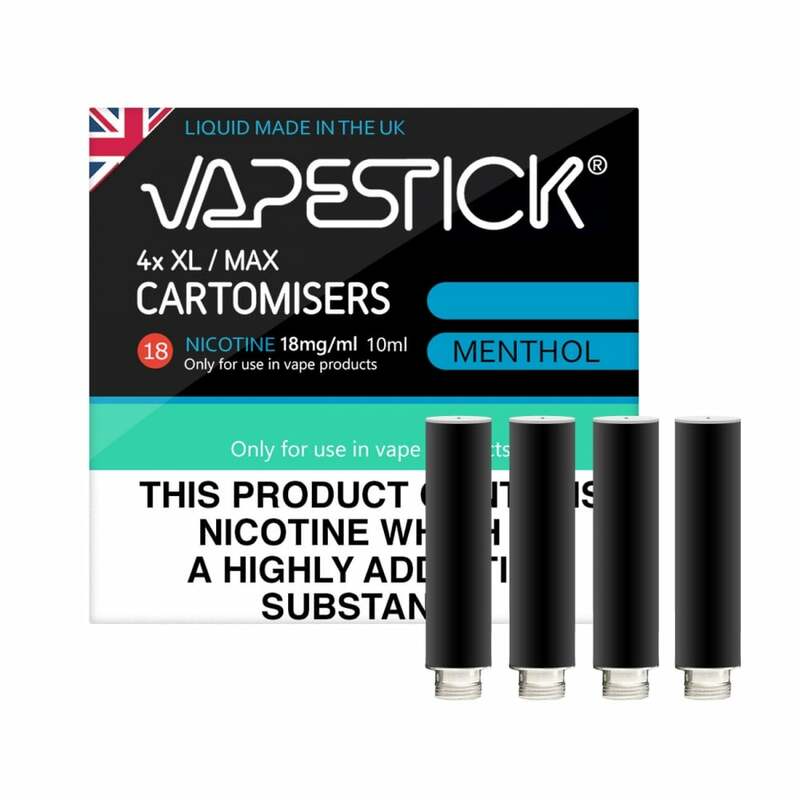 Perfectly balancing the mint and menthol notes, Vapestick Menthol Cartomizers genuinely replicate the smoothness of a traditional menthol cigarette. Vapestick made it clear when formulating this e-liquid that they needed additional time to get it right and when you taste the icy freshness you’ll appreciate why they waited. Available in 24mg, 18mg, 11mg nicotine levels or even nicotine free you can tailor your perfect menthol vape with Vapestick. Compatible with the Vapestick XL Starter Kit, Vapestick Cartomizer Refills are designed to be user-friendly and quick to slot into place. They offer authentically flavoured e-liquid for satisfying vape experiences. Cost effective too, each four-pack of cartomizers will deliver around the equivalent of 120 cigarettes worth of vaping. I use the 1.8 mg strength menthol Vapestick cartomizers and since switching to this system (I really can't be bothered with the liquid vapes) 3 years ago I have not needed a traditional cigarette . Excellent product works out to about £1.50 per pack of 20! Great product, easy to use and helps tremendously with cravings. Would recommend to anyone giving up smoking. Lovely minty flavour, different to my usual brand, but still enjoyable. I cannot review this product because I purchased 1.8mg not 0.0mg. The cartomisers I ordered and use were good and cheaper than my usual suppliers. I am very satisfied. Best choice which helped me stop smoking. Without this product giving up smoking would have been impossible. I am pleased to say that I have been smoke free for over 6 months now. Thank you vapestick. Great product, reasonably priced, always quick delivery. Only reason I’ve not given 5 stars is it’s frequently out of stock. These refills are perfect for my use. They are great value for money. Why do they keep running out of stock? They don't even know when they're going to receive more in stock of 1.1% Menthol.. That was the comment I received Really, really annoying. Having just changed to this brand recently. My absolute favourite of all time. Definitely the best I've ever tried, and I have tried quite a few. I am new to vaping having recently packed up smoking, these suit me well. These are great cartomizers! Each one lasts about two days. Great taste, and great value for money. Always a speedy delivery too. I haven't smoked for almost a year and it's a lot to do with these ecigs! I recently tried the Vapestick brand after several years using Blu and what was SkyCig. Blu have stopped making the flavour cartomisers I liked (Blu menthol 18mg) and their products have changed along with the flavours. Vapestick menthol is a very fresh, clean and more minty flavour and I like it very much. The batteries last slightly longer than the original Skycig/Blu and the cartomisers much longer. With four cartomisers in a pack they are very good value from Electronic Tobacconist (especially if you buy 8+). I am very pleased I tried them and bought them from ET. I love these cartomisers - have been using them for a long while and just discovered the excellent value from Electric Tobacconist. Cheaper than getting them direct from Vapestick. They are very easy to use, have a great flavour and excellent strength. I far prefer them to using liquid. I've been ordering these cartomisers for over 2 years and never had a problem, the product and service has always been excellent. Unfortunately, on this occasion my menthol cartomisers, which are clearly labelled 'menthol' taste of coffee flavour so obviously a mishap on the production line!